Do you want it, or do you want what it means to you? More than what something ”is,” is what it means to you. 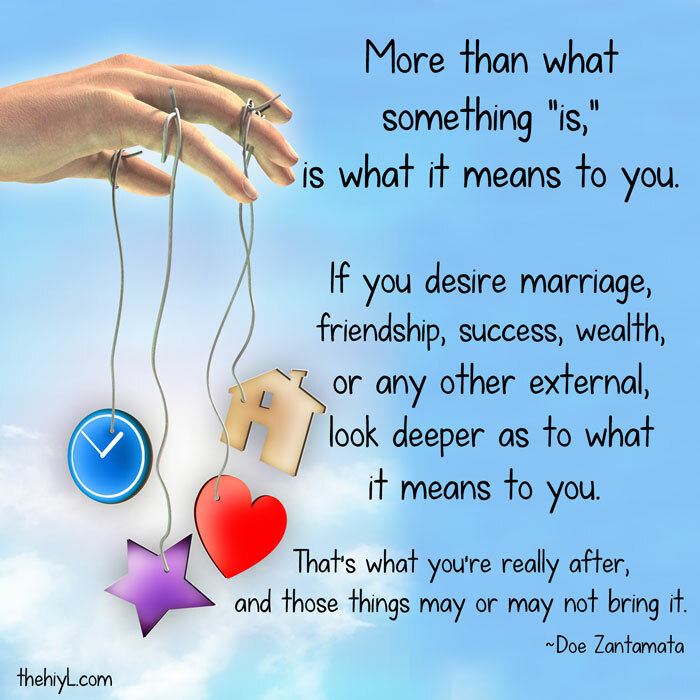 If you desire marriage, friendship, success, wealth, or any other external, look deeper as to what it means to you. The very same thing that represents security to one can be confinement to another. What looks like freedom to one may be a burden to another. Pursuing an outer goal in search of what it represents to you may leave you confused and unfulfilled if it turns out not to bring with it what you really desired. Being secure with everything, including change, brings security. Loving and accepting yourself and others brings love, whether single, dating, or married. Focusing on appreciation for what you have and in your abilities brings freedom, not money itself.